“We believe in our race—in the fellowship of our race and the preservation of our race. We are the only people today that are actually participating in the preservation of the white race around the world. If we don’t condemn the threats against our race, it will no longer exist…That’s basically why we feel the way we do. We also believe that no race will live up to it’s potential if it’s mixed with another race, it only dilutes as it does with any situation in the world”. Established in 1866, the Ku Klux Klan still remains one of America’s most secretive organizations. New York photojournalist Anthony Karen first transcended that secrecy several years ago when he got the opportunity to photograph a KKK cross-lighting ceremony; since then, he has been documenting Klan organizations throughout the country. Those photographs are compiled to form an absorbing document of one of the most notorious groups in history in The Invisible Empire: Ku Klux Klan. Taken with unrestricted access, Karen’s images bring us deep inside America’s most private white nationalist organizations. Beginning with a brief introduction into the history of the Klan, the book provides detailed visual accounts of modern-day Klan life, including candid shots of rallies, individual portraits of Klansmen and women, as well as a look at the naturalization process for new members. Presented in intimate profiles are a functioning Klan ministry, a group that has merged National Socialism with Klan ideologies, and a 58-year-old seamstress who makes custom Klan robes, among others. 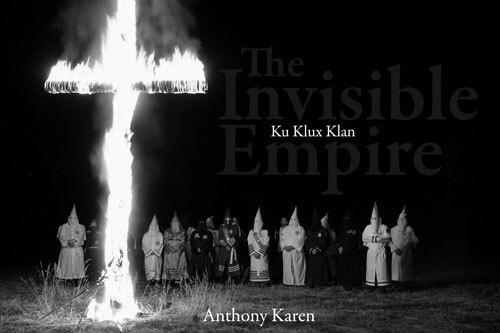 Accompanied by quotations from the late Dale Fox, Imperial Wizard of The Brotherhood of the Klans, The Invisible Empire offers an unprecedented glimpse into the shadowy society and its mysterious inner workings. Anthony Karen is a photojournalist based in New York. His passion for photography began in Haiti, where he documented the various Vodou rituals and pilgrimages throughout the country before embarking on the Ku Klux Klan project. Karen served in the U.S. Marine Corps and worked for many years in the personal protection industry. He has traveled extensively worldwide and has worked with many humanitarian groups, including the Humane Society of the United States. He currently freelances for World Picture News.